A noodle dish with shrimp sauce topped with shrimps, pork, chicharon, tinapa flakes, scallions, and fried garlic. Tip: Adding a beaten egg to the sauce while cooking makes it tastier. You can use fried tofu and kamias. 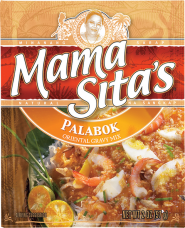 Sauté garlic, half of the tinapa flakes and stir in the dissolved Mama Sita’s Palabok Mix. Bring to a boil while stirring occasionally. Lower the heat and simmer until sauce thickens. Remove from heat and set aside. Bring 2 liters of water and 2 tbsp cooking oil to a rolling boil and drop the noodles. Leave for 1 minute or until noodles are cooked. Drain and rinse with cold water. Mix in 1 tbsp of cooking oil to prevent noodles from sticking. Arrange the noodles on a platter lined with banana leaves. Pour the sauce over and garnish with boiled egg, toasted garlic, chopped spring onions, chicken flakes, crushed kropek, remaining tinapa flakes, and calamansi halves.